Backyard chickens can stand very cold temperatures and most breeds don’t normally have any problems getting through a UK winter providing they have shelter available from wind and rain and sufficient food which they turn into energy to keep warm. There are however a number of things to consider as the winter approaches to ensure your chickens get through the winter without any difficulties. With their feathers trapping air for insulation, chickens keep warm even in cold temperatures. Chickens eat to meet their energy needs and in the colder months, they will need more energy to keep warm so you can expect your hen’s food consumption to go up during the winter. The most notable thing about the winter months for the back garden poultry keeper is the shortage of eggs. Most chickens will stop laying during the winter months. Even highly productive hybrid hens that are still laying when the day length is short may not have enough time to eat sufficient food to keep their energy high enough to keep warm and lay eggs. 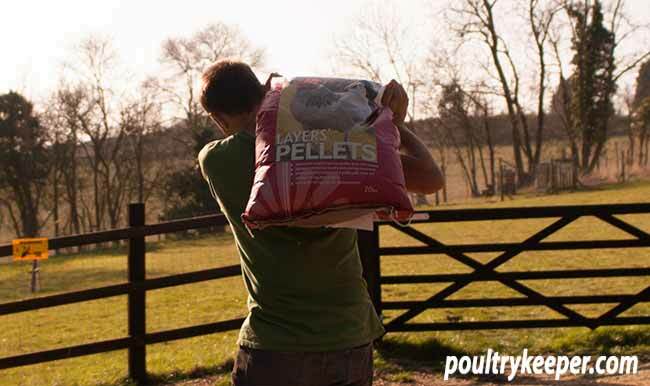 Feed a high quality poultry feed during the winter and consider extra light for good layers if you need to keep your chickens laying into winter. Eggs are mostly protein so cutting back on rations or feeding cheaper feeds such as wheat, especially in winter is false economy. If they don’t stop laying or increase their energy, they will start to lose weight which can in turn be detrimental to their health. If you keep any of the very productive hybrids (like Warrens, Goldlines), you may consider providing them with a couple of hours of light first thing in the morning to give them some extra time to top up on their energy requirements. If they stop laying, it is best to remove the extra lighting, letting them rest until they start again naturally in the spring as the day length increases. Unless you have a no-maintenance plastic chicken house or maybe a brick barn or outbuilding as a coop then the chances are you have a wooden chicken house that will require some maintenance. Most coops are built with pressure treated timber but after a few years will start to soak up the moisture and can do with a coat of pet-friendly preservative or paint to make them last and keep the wet out of the wood. I like to use different coloured paints for my coops but if you are on a budget, there are many shed and fence preservers available that don’t cost the earth. After a couple of years, the paint starts to flake, on the roof of the coop and nest boxes, especially after I’ve been attacking red mite with the pressure washer and wallpaper steamer! 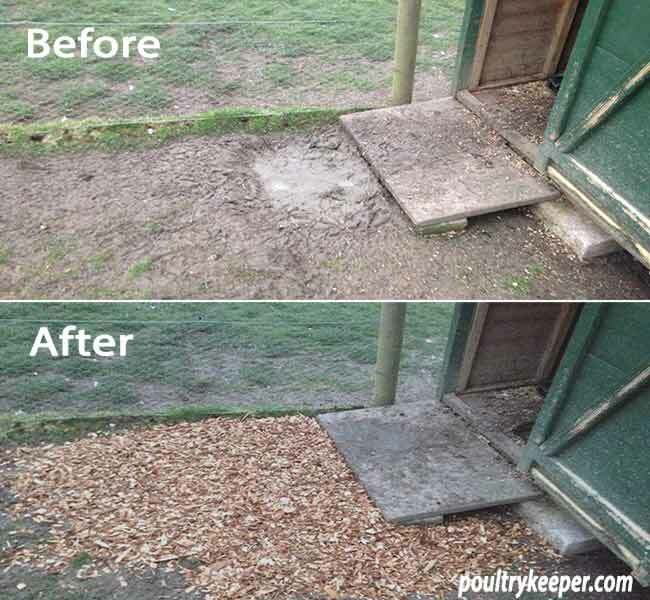 Clean up poultry houses and give them a coat of pet friendly paint or preserver. Little helpers are always welcome. Now is a good time to clean up any loose paint with a scraper, give it a quick rub down with sandpaper and apply a coat of paint when the wood is dry. Ventilation is essential for chicken houses (I wrote about ventilation in chicken houses in this blog post) but unless you have adjustable vents on your coop that can be closed during cold windy spells, you should cut a piece of wood that will block part of the normal opening if the wind picks up and blows in the wrong direction. I tend to point all of my vents towards the North, to avoid the prevailing south-westerly and the cold east winds we get here although when it does blow from the north, I have to cover the vents up. An adjustable vent on one of my chicken coops. One thing is certain, water containers will freeze and if they do, you may find they crack. I have accidentally knocked a water container when it’s frozen whilst trying to get the ice out and it doesn’t take much to crack the plastic. It’s a good idea to check food and water containers and buy a spare, just in case you lose one. Frozen water containers need defrosting and refilling. I sometimes have an extra helper! Water is of course essential for poultry, even on cold days so it can be hard keeping fresh water available for chickens when the temperature drops below freezing. There are a few ‘tricks’ to doing this. There are some excellent heat pads available if you have an electricity supply outside. These warm the water slightly keeping it from freezing. Another trick is to use a few drops of glycerine in the water. 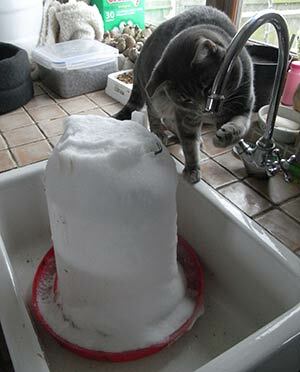 This lowers the freezing point and therefore keeps the water from freezing for longer. On really cold days, you’ll need to add a couple of extra drops. There is always confusion over glycerine on the poultry forums. Some people suggest it’s used in antifreeze and shouldn’t be given to chickens. Vegetable glycerine is a simple polyol (sugar alcohol) compound though and is used in cake baking as well as many foods as a sweetener and preservative. I know many breeders who have used it over winter in their water containers for years without any side effects. During really cold spells, I usually hang a smaller water container inside the chickens house if I’m going to be out all day, in the hope of keeping some fresh water available for them. This can get the water out of the ‘wind chill’ and slow down freezing a little but it still gets frozen eventually. Birds on the same piece of ground can quickly turn it into mud. This is especially true during the winter because the grass isn’t growing. 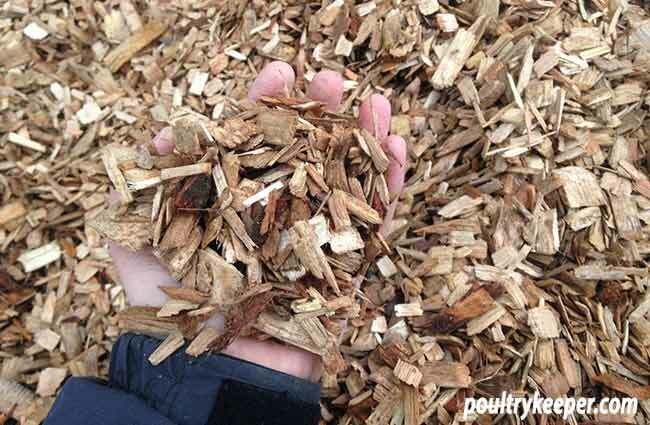 Hard wood chips can be used to cover muddy areas in large runs and can be used to fill smaller runs. Smaller runs can also be covered which helps to keep the wet out. Hardwood chippings can be bought in small bags or even cubic meter / tonne bags and are very good at providing drainage to muddy areas such as outside doors, gates and pop-holes where there is a lot of traffic. Mud is an ideal breeding ground for poultry worms so poached muddy areas should always be avoided. Don’t be tempted to use bark chippings, these are cheaper but tend to hold the wet and rot. When they do, they can harbour mould spores which can cause Aspergillosis. Before and after photo of the entrance to one of my poultry houses. We aren’t all lucky enough to be able to have more than one run so that birds can be moved around but sometimes using portable chicken fencing like this one from Omlet I reviewed can be useful to allow birds to ‘strip graze’ or can keep them off particularly muddy areas. Remember ducks and geese will need constant access to clean water for washing. A lack of water and excess of mud can cause a condition known as wet feather which is a problem that needs to be avoided. As brutal as this seems, if you keep too many birds on your ground over winter then all of your birds will suffer so it is better to make some tough decisions now. Ducks are especially bad at this with their dipping and probing beaks. A wet piece of grass can turn into muddy holes in no time at all. During the wet winter months, we keep our ducks and some of our chickens in a covered run with a gravel base which stops them from ruining the grass in their normal run. During really wet weather, the chickens usually stay huddled up out of the rain anyway so there are no benefits to them being out on the grass anyway. The ducks of course love the rain but are usually quite happy around their pond in a gravel run during the wet weather. 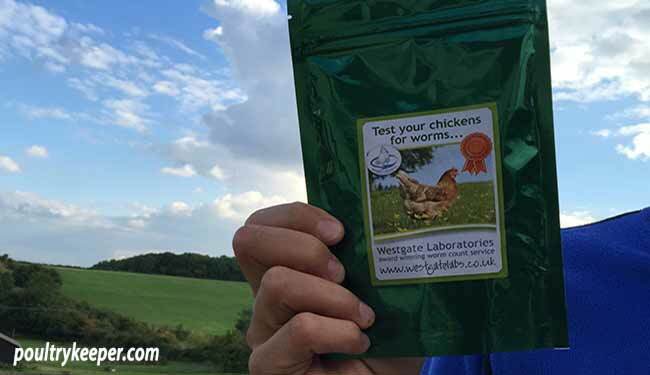 Worms carried by chickens can only be accurately checked by getting a worm egg count done from samples of droppings. In days gone by, this was very expensive because it involved a trip to the vets, a consultation fee and the cost of the worm egg count. As a result of this, most backyard chicken keepers would worm their birds routinely every 6 months or so with Flubenvet, usually in autumn and again before the breeding season in spring. The manufacturer recommends worming even more regularly than this as well. Routine use of drugs is not recommended because eventually, drug resistance builds up. Quite simply, this is where some worms survive the treatment and go on to produce more worms, some of which will also have this resistance and eventually, a drug resistant strain of worms evolves! Worm egg count kits can help you avoid the routine use of wormers. Whilst I keep some Flubenvet in stock, it can be very hard to buy at times so have looked at alternatives when it isn’t available, however I also discovered that worm egg counts kits can now be bought online for around £12. I am now testing for worms first before considering to use Flubenvet. 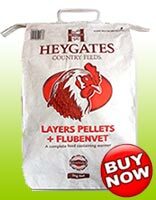 60g packs of Flubenvet 1% contain enough to treat around 20 large fowl but at the time of writing, are unavailable from the manufacturer. Their next production run is March 2016. (unless the feed mill runs out of Flubenvet!) in 5 and 20Kg bags. Just buy enough medicated feed for your hens to last them 7 days. Herbal products such as Verm-X could also be used instead if you are using a worm egg count kit to check for worms periodically. This allows you to take a more organic approach to keeping chickens. Why should you worm in the autumn? Worm eggs do not develop below 10⁰C so you can de-worm your birds now and know that you shouldn’t see problems caused by worms over the winter months. A chicken’s immunity is challenged by worms and winter is a hard enough time for them (and you) anyway, so it’s one less thing to worry about. Remember at this time of year, there are hungry rats and mice around. Take care with the storage of your feeds and keep an eye out for the tell-tale signs of vermin. Don’t ignore them or you will suddenly find you are over-run. You can read more about controlling rats here in the pests and predators section. There are lots of people who say ‘chickens will cause rats’ but that isn’t correct. 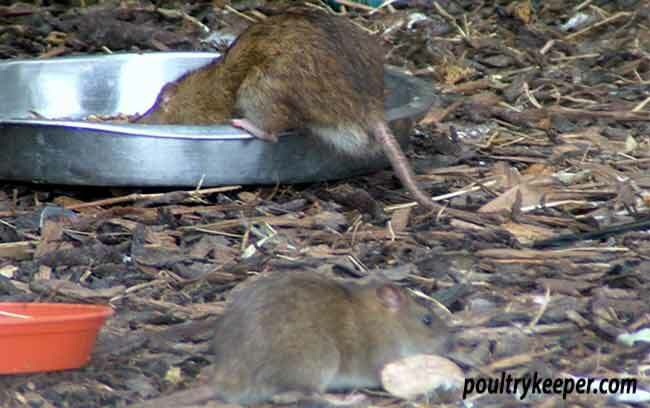 The rats are attracted by their food, water and sometimes shelter (under chicken houses or sheds for example). If you remove these 3 things, there won’t be a rat problem. I can hardly blame them for moving in if the weather is cold and they can get a free meal! Birds need clean, dry bedding so ideally need cleaning out weekly. Bedding on the floor of the coop can get very wet during the winter because droppings don’t dry out as fast but the birds will also tread a lot of moisture in to the coop from their run. Wet bedding is the ideal breeding ground for harmful bacteria and ammonia released from wet droppings can cause respiratory and eye problems. 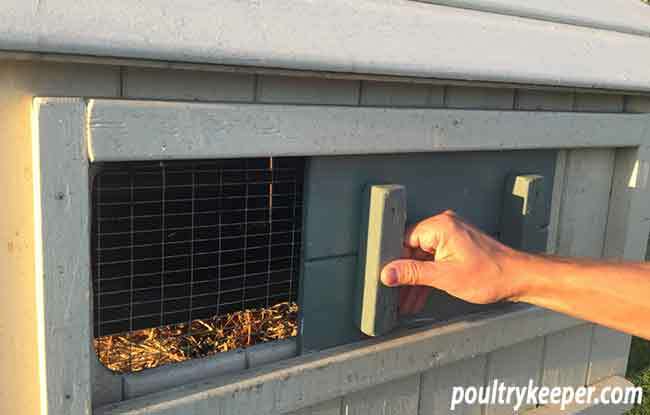 Ensure adequate ventilation is provided at high level to remove the ammonia that builds up inside the coop and keep their bedding dry. As a good rule of thumb, if you put your head in the coop in the morning and can smell ammonia, you need to change the bedding. Bio-Dri works really well at keeping bedding dry, effectively extending the time between cleaning. It disinfects and sanitises and is effective at absorbing liquids. It helps to keep the ammonia level down in the coop so I use it over the winter, sprinkling it on the floor of the coop and into the bedding. 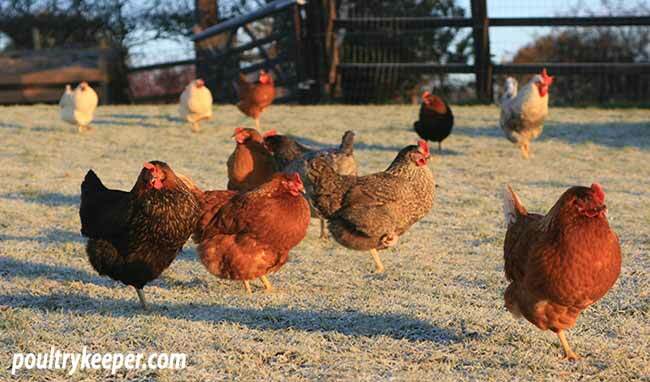 So there you have it, my top 8 tips for keeping chickens over the winter. I hope this gives you some ideas for getting your birds through the winter. Do you have any comments or tips of your own? I’d welcome some feedback, who knows, maybe we could get to 10 tips!